This moment marks the end of a long journey for the tropical plants Jean has rescued over the last 12 months. In the summer of 2012, Center Parcs commissioned Jean to source, collect and care for tropical plants for the interior areas of the new Center Parcs Village in Bedfordshire. In 2013, Jean travelled around East Asia collecting plants from areas threatened with deforestation. After months of travelling and working with local villagers to collect and look after plants in local nurseries, the 6,000 plants were then transported to Rotterdam where they have been looked after and acclimatised in 15 metre high greenhouses. 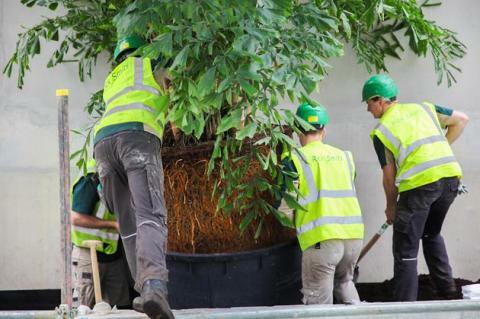 It will take four weeks for all the tropical plants to be delivered to Woburn Forest with a majority of the plants being planted in the Subtropical Swimming Paradise, in the heart of the Village and others being planted in other internal areas such as the Sports Plaza and the Aqua Sana Spa. All the tropical plants will be planted at Woburn Forest by the end of April and from then will be cared for by Center Parcs’ Tropical Plants Rangers. Woburn Forest, Center Parcs fifth Village, is on track to open in the spring.